The CGS Aberdeen on her sea trials. Image from the Canadian Coast Guard. The Canadian Government Ship (CGS) Aberdeen was built in Paisley, Scotland in 1894 for the Canadian Government. Picked up by a crew from where she rested on the shores of the river Clyde, she left Scotland on August 26th and arrived in Halifax on September 7th. Originally intended to be an Atlantic service vessel, she was obtained by the Quebec branch of the Coast Guard and became a lighthouse supply and buoy inspection vessel. Being built right at the turn of the century gave her a couple of interesting design features. For one, even though she was a hand-fire coal burning ship, she still had sails on her fore and aft to be used in case of emergencies. This meant that she maintained some charm of the old sailing ships while embracing new technology. The downside to this was that when the sails were in use, or even stored on deck, it was difficult to protect them from damage caused by the red embers drifting from the stack. The first captain of the CGS Aberdeen, Capt. M. P. McElhinney and his crew. This, and the changing steam technologies, resulted in her being put in for refit in the spring of 1905. 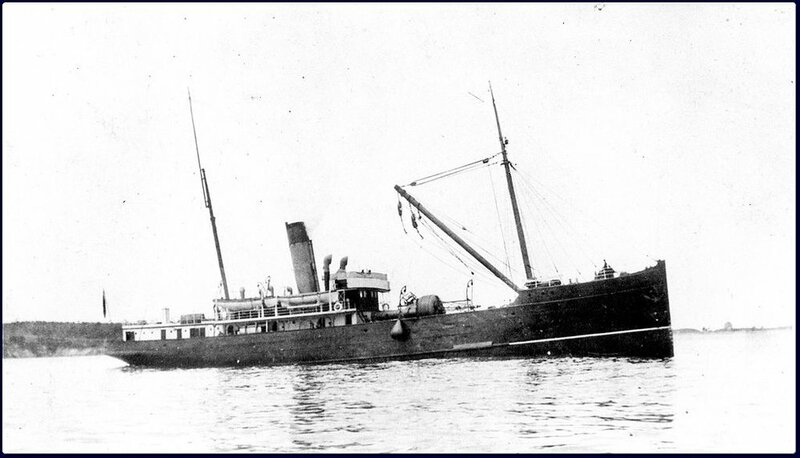 It should have been the winter of 1904, but while sailing to Toronto to be put into dry dock, the Aberdeen was trapped in the ice off of Soulanges, QC. She spent her winter in Quebec until the St. Lawrence thawed in the spring, allowing her to complete her trek. She came out of her refit with all new boilers, and a high forecastle deck (her previous layout had been flush with the main deck). Her sails and masts were removed, and on the bow a new heavy crane was installed. She set back out a few months later to resume her duties throughout the Gulf of St. Lawrence. With her crew of 45, she had a successful and seemingly uneventful career. That is until the afternoon of October 13, 1923. 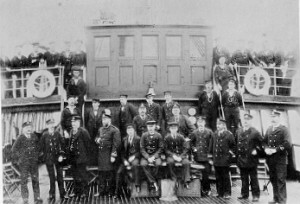 That morning, the Aberdeen, under command of Captain Loran A. Kenney, had left Yarmouth, NS in heavy fog on an inspection tour. It should have been a routine trip - they had some buoys to check on, depth soundings to take, and a delivery of 500 bags of cement for Cape Sable lighthouse. On board was also the Superintendent of Lighthouses John Kelley, Marine Agent J.C. Chelsea, and Engineer P.F. Morrison. CGS Aberdeen. Image from the Canadian Coast Guard. As the Aberdeen neared Seal Island, NS, it came upon an area called the "Black Ledge". Here, the captain slowed the engines in preparation for depth sounding check. As they came within almost 2.5km of Seal Island, the lookout spotted an obstruction in the water. The order was given to throw the engines full astern, but it was too late. The Aberdeen struck the sunken wreck of the trawler Snipe, which had run aground in the area earlier that year. The collision ripped a 7.6m hole in the side of the ship, causing her to fill and settle on the ledge in 15 minutes. The crew sent out a mayday, which was picked up by the CGS Laurentian (Aberdeen's sister ship) from Saint John, NB, as well as the Acadian from Halifax and Arieux from Brier Island, NS. The crew of the Aberdeen were actually fortunate that she sank where she did - had she slid off the shelf, there would have likely been a complete loss of life. Because she settled in shallow water, not a single life was lost. There was one more complication to deal with, however. In addition to her 500 bags of cement, the Aberdeen was carrying drums of calcium carbide. This made everyone very nervous because when this mixes with water, it forms the flammable gas acetylene. So while 25 of the crew took the ships boats and made it to the Seal Island Light Station, the rest of the crew stayed behind to salvage as much off the wreck as they could. They successfully managed to clear out the Aberdeen with no injuries. That's all for now everyone. Enjoy the rest of your week! Today (Feb. 25) I received a message from a family member of Capt. Loran A. Kenney, who suggested that it was his great-grandfather who was the master of the Aberdeen and that his name was misspelled on the Coast Guard documents. After doing some digging and the family sending me a copy of the obituary, I can confirm that this is the case, and I've updated this article accordingly. Thank you so much to the family for following up with me!